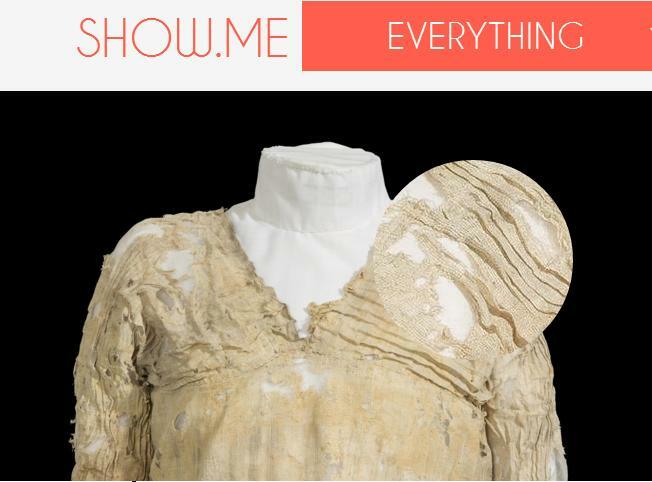 th Junem You might remember me blogging about a project I worked on called Show Me; an educational website that presented museum, gallery, archive and heritage site content for a schools audience. This website was part of a wider project called Connecting Collections, which you can read more about with Culture24. 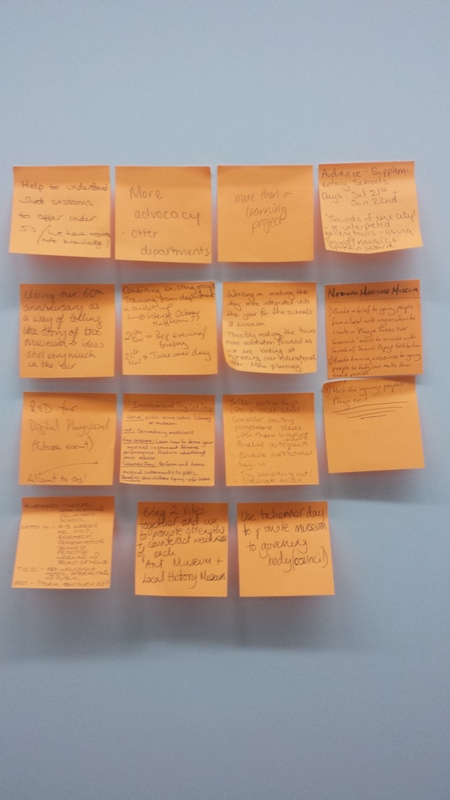 On Monday 29th June, the National Maritime Museum in Greenwich played host to the first Connecting Collections Conference, and although I wasn’t able to make it there myself, I was able to follow the action on twitter using #CCConf2015. #SoTrue. There was also research being shared, like this paper from Arts Council about online resources. As well as reminders that while all this shiny tech is fun to play with, we should look away from the screens and look at the real world. There were also interesting perspectives shared, like this one from Daniel Martin from Derby Museums. And of course, this still needs to be sorted! For those of you who haven’t heard of the incredible initiative that is Takeover Day, it’s a day when children and young people take on adult roles and grown up responsibilities for a day. This year, Takeover Day is happening in England on 20th November, with other dates for Scotland and Wales. For museums, galleries and other cultural organisations, the idea of letting children and young people ‘take over’ might sound absolutely terrifying, but it can lead to some meaningful decisions being made and outcomes that are beneficial to the organisation and their audience. Takeover day is about widening access, raising aspirations and creating opportunities to develop those all-important employability skills for young people. At a planning and sharing meeting organised by Kids in Museums, we heard case studies about what happened at Shakespeare’s Birthplace Trust. We also learned about Royal Albert Memorial Museum’s brilliant BSL film project. Recruiting can take a lot of time: try and build relationships with existing groups (schools, nurseries, clubs). Keep in touch: offer something sustainable and consistent after the project – invites to exhibitions or events can work well. You can read some more on the post-its. As you may or may not know, I have a particular interest in Early Years in Museums, and hearing first-hand about a Toddler Takeover at the Cutty Sark was fascinating. The Cutty Sark’s Takeover involved 30 year 6 students from a local school that hadn’t visited before and about 80 toddlers. Sharondeep from Cutty Sark had some great tips on working with schools and nurseries. See if the school, children and young people can help in getting the word out. The Ship used the day develop, road test and fine tune new activities for their under 5 audience and to build stronger relationships with a local school. From the stats shared, it seems like they were successful: 100% of participants enjoyed the project and café income was 3 times higher than usual! If you’re planning on doing something with under 5s, think very carefully. Ask yourself this question: are the children able to have a say in decision making or is this just a nice event? Which group do you want to work with? What will be the focus of the day? Noel also underlined Sharondeep’s earlier point about making an early start on your project. He shared his process and timetable as a guide. Have an initial meeting in July to get the ball rolling. Things you could discuss include: the group’s preparatory visits, which groups to work with and practical issues. Noel advocated a gradual approach to communicating with children and young people. An all-guns-blazing message of “YOU’RE GOING TO TAKE OVER!” might be overwhelming for some, especially those with additional needs. Can Children’s interests be built in to the activity? Maybe revisit an old idea that didn’t quite work – can the children come up with a solution? 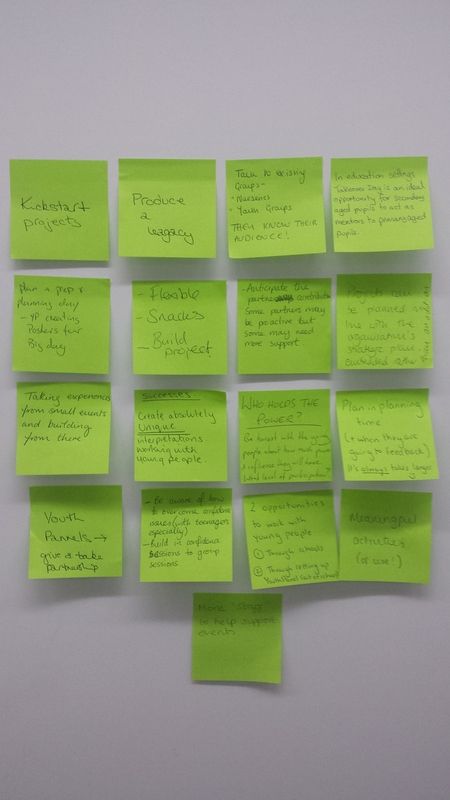 Other Bright Ideas were captured on post-its. Kids in Museums takes the lead on facilitating Takeover Day in Museums, Galleries, Heritage sites and cultural organisations (I think that covers just about everything in the sector) and are a valuable source for inspiration, ideas and help. You can find lots of case studies, fact sheets, tips and reports on the Takeover day section of the website. I hope this helps inspire some museums to run a Takeover Day this year, and if you would like to learn more, Planning and Sharing meetings are happening all over the place. Takeover Days are a fantastic way to develop and build relationships and partnerships as well as learning so much about your audience and what they want, but remember: it’s more than a day. The lessons learned, and discussions had should have an impact beyond the actual day. Learning is no longer confined to the classroom. This is a fact. It is also not confined to the usual places you might expect learning to happen either. With the increased connectivity we have nowadays, a learning environment can be anywhere with access to the internet. What does this have to do with Museum education? In a previous job, I was responsible for collecting, collating and -dare I say it- curating content for an (award-winning) educational website which you may have heard of : Show Me. The aim of the site is to facilitate classroom learning by presenting and show casing content from museums, galleries and archives. If you read my other blog, you may remember my post about the kind of things Show Me has to offer but what I want to do now is share some of the things that I learned whilst working on the site. Now, we weren’t really that surprised when we saw that the crafty-themed pieces proved to be popular with our audience. 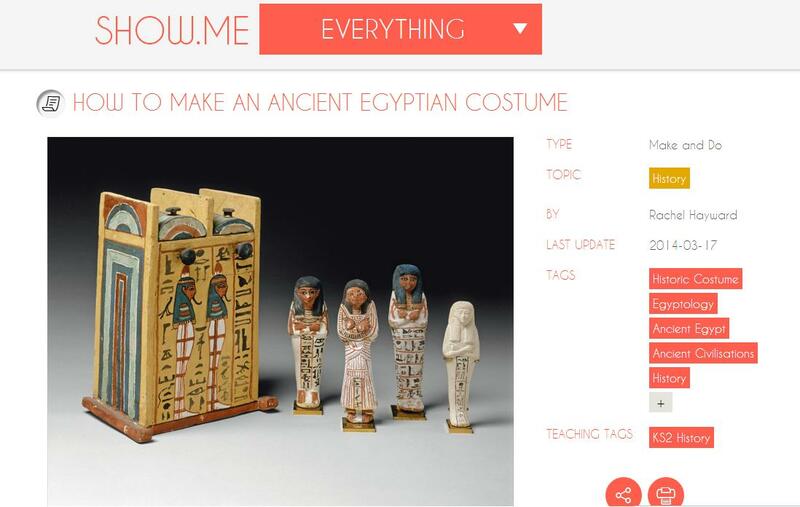 It seems like lots of people want to know How to make an Ancient Egyptian costume or how to make a Roman shield. In fact, those are the most popular things on the site. But, we wanted to highlight the museum collection objects on the site. How, we asked ourselves, could we do that? The answer was simple. Listen to your audience! So, I used my museum-y knowledge, garnered from years of museum adventuring to track down some suitable objects. In a moment of serendipity, the Canterbury Museums were very excited about an Iron Age soldier helmet that had been recently discovered and were very happy to share it on the site. We were also lucky enough to have the Petrie Museum share their famous Tarkhan Dress – an actual Ancient Egyptian costume, that happens to be one of the oldest garments ever discovered! However, sourcing these objects and getting them on the site was only the first step? How do we draw attention to them? And, how can we draw attention to the other wonderful objects and artefacts? Again, the audience provided an answer: put these things where they can be seen. It turned out, unsurprisingly, that related content is key: these pieces might have incredible stories, but no one is going to learn about them if you let them languish in a dusty corner of the internet. With the tunic and the helmet, we were fortunate enough to have related content that was already popular that could point the way to them, which has led to the objects being the most viewed ones on the site. Digitising collections is an important task, it allows wider access to objects and artefacts that might not necessarily be on display. The British Museum, amongst others, has a really great online collection if you want to have a look at what can be done with sufficient time and resource. However, if you’re planning on using this kind of thing as a teaching tool, you really have to think about your framing – what are you putting around the piece to contextualise it? Museum education isn’t just limited to what happens during school visits or what goes on in the ‘learning space’ if you’re lucky to have such a room set aside. For me, ‘museum education’ touches on all aspects of the museum experience. It doesn’t necessarily have to be an active thing. If a visitor learns something from their visit: boom – museum education happened. The thing is, how can you make this kind of passive learning happen as often as possible? One of the easiest solutions is to make the interpretation as simple as possible. This does not mean dumbing down. If anything, it means the opposite. There’s a real knack to explaining complicated ideas simply. Think about it, if you can’t explain a concept in terms anyone can understand, do you really understand the concept? This brings me nicely to an example. The Grant Museum of Zoology has, in my opinion, a fantastic approach to their text labels and how they approach the display and execution of their work in general. I’ve written before about the Grant Museum’s interesting interpretation and after a recent visit, I want to talk about it again. This is why: dinosaurs. Actually, what I want to discuss is ‘dinosauriness’ which is a brilliant word that needs to be used more. 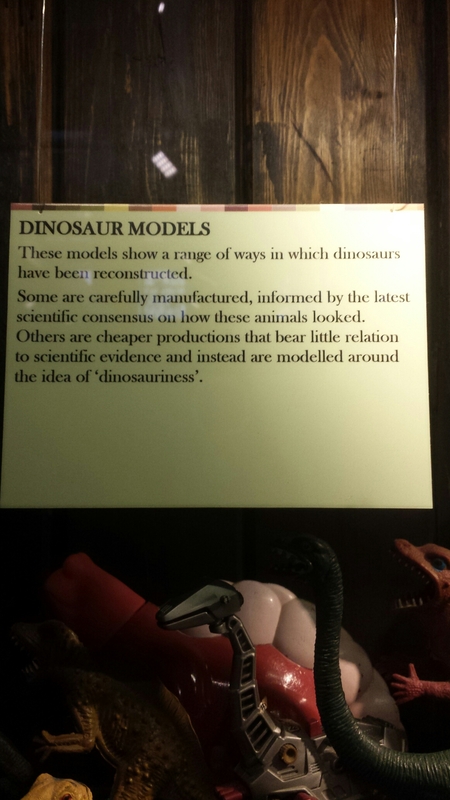 All of these models and toys represent an idea of what a dinosaur is. Some are based in scientific fact, others aren’t. The label explains it better than I can. There’s something philosophical going on here, but in a really really accessible way. Even small children should be able to grasp the point. It also ties in nicely with a part of their Strange Creatures exhibition. Strange Creatures explores the art and representation of odd and unknown animals. 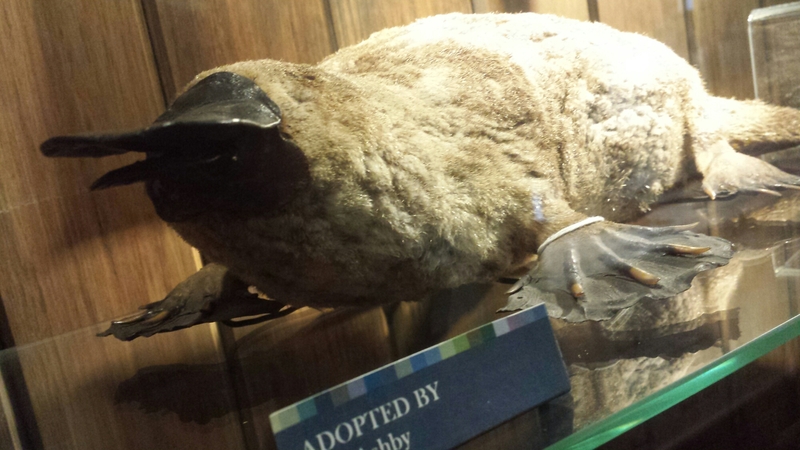 I found it really interesting to compare this to the taxidermy section which had the classic bad taxidermy of someone who has never seen the creature he is working on. In both cases the representation expresses an idea of the creature: a certain dinosauriness, a certain ‘platypusiness’. So, to sum up: museum education is about all learning in museums and no one is ever too old for toy dinosaurs. 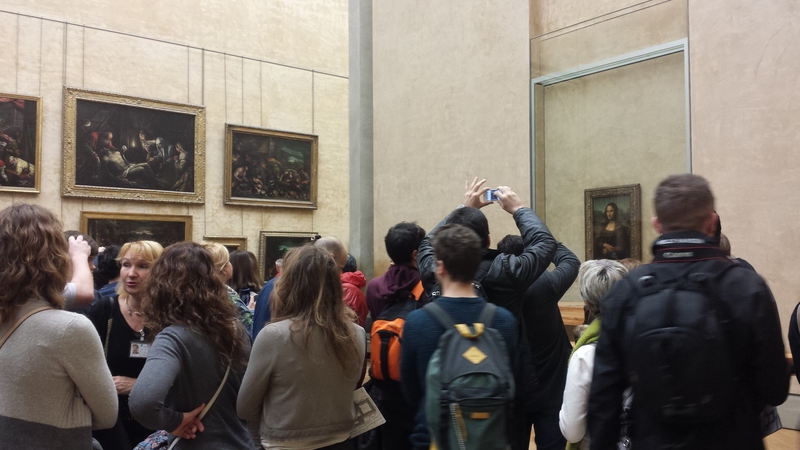 People who work in museums can make terrible museum visitors. I don’t mean that we run around touching objects, locking paintings or otherwise making a nuisance of ourselves, I mean that we, as a species, find it difficult to switch off and just be a visitor. We’re always looking at the arrangement of objects, artefacts and artworks, and scrutinising the interpretation. We don’t just look and learn; we hunt. We hunt for things we like, so we can steal try to introduce them at our museum and for things we in turn do a lot better. This happened to me not too long ago when I visited Defining Beauty at the British Museum. With a title like that, “Beauty” really needed a definition, or at least an exemplar. Although the exhibition has a good trail, I still made up a little activity to do to answer the question implied by the title – what IS beauty? Alexander the Great: a great beauty? So I decided the best way to figure this out was to do a bit of counting. Which characters were popping up again and again? Surely, if a god or goddess popped up a few times it would imply the museum thinks that they demonstrate the ideals of beauty? Since starting at Towner in March, I’ve been working on a project called Open Sesame. It’s a magical phrase that leads to hidden treasures, so it’s more than appropriate for this kind of work. The project is all about opening up cultural settings to under 2s and their carers through working with children’s services providers. My work on this programme is one of the reasons I was inspired to start this blog, so I could share some thoughts and some learning. But, before I get going on any of that, I thought I would write a bit about the background of the project and the work we’re doing. Apart from Towner, cultural organisations (not *just* museums) across East Sussex including Glyndebourne, Hastings Museum and Art Gallery, Jerwood and De La Warr Pavilion are partnering with a local Children’s Centre. The aim is to work together to share skills, resources and to develop what we can offer very young children and their families. The development is going to be the interesting part: how can we update and improve our offer, how can we make the most of the resources we have, and how can we keep this partnership going? The latter is becoming increasingly important to me as we are forging a really strong link with the staff and the families at our local Children’s Centre and I would hate for that to fade away. As well as working with Early Years Professionals, we’re also working with a Creative Practitioner from Octopus Inc. The Creative Practitioners bring to the table new ways for us to look at things, and all sorts of ideas to help us nurture creativity in the little ones. We are reaching the mid-point of the current phase of the project, and things are really starting to come into focus. Our understanding of playing, learning and play learning (yes, they are all very different, yet interconnected things) has really deepened since the start of the project and I have lots of things that I want to share. These bits and pieces have come from things I’ve picked up as part of our reading, things that have happened in sessions, and general reflections. I’ll get to them eventually, I just need to decipher my notes a bit first! Hello and welcome to a brand new blog from the Museum Adventurer. For nearly 4 years, I have been blogging about my visits to museums all over the world over at Jack’s Adventures in Museum Land and now I felt the time was right to start a new blogging project. Don’t get me wrong, I’m still going to continue to chronicle my visits and adventures in museums on my other blog, but since I started a new job in the Learning Department at Towner I felt like I needed a new space to share my thoughts on Museum education. To be honest, I’m surprised it has taken me this long to start something like this, as I’ve been working on the education side of things since I started working at the British Museum way back when. I got here eventually though, and that’s the main thing. So if you would like to follow my thoughts on all things Museum Education, do give this blog a follow.